Remove the rubber cover A » Fig. 154 on page 170. 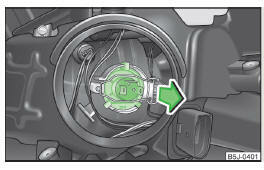 Remove the connector from the bulb, unlock the securing clip and remove the bulb » Fig. 155. Insert a new light bulb in such a way that the fixing lugs of the bulb socket fit in the recesses of the reflector. Lock the circlip and insert the connector in the bulb. Fit the rubber cover A . Remove the rubber cover 1 » Fig. 154 on page 170. 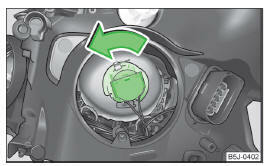 Turn the socket with the bulb to the stop in the direction of the arrow » Fig. 156 and remove it. Fit the rubber cover 1 .